Harold A. Peterson was born in Essex, Iowa in 1908, received te BS and MS degrees in Electrical Engineering from the University of Iowa. Following 12 years with General Electric, he became Professor of Electrical Engineering at the University of Wisconsin-Madison. After retirement from the University as Professor Emeritus, he continued to contribute to the profession and to research at the University. On joining General Electric shortly after graduation, he quickly established himself as an authority on power systems analysis and on transients in power systems. He was one of a small group of exceptionally talented and closesly associated engineers, that included Edith Clarke, Charles Concordia and Selden B. Crary, who made so many significant contributions to power systems engineering in the 1940s and 1950s. Professor Peterson has authored more than 50 technical papers during his long and productive career. His book "Transients in Power Systems", published in 1951, was regarded as one of the classic references in the field. A Fellow of the IEEE and active in IEEE affairs, he has served on many Institute committees, including: Protective Devices, Power Engineering Education, Transmission and Distribution, Founders Award, and Power Life award; he was Vice-President, Great Lakes District of AIEE in 1962. On the national scene, he has served on the Advisory Committee on the International Exchange of Persons, and assisted the Federal Power Commission as a member of the Northeast Blackout (1963) Study Committee and as a Chairman of the Advisory Committee on Underground Transmission. 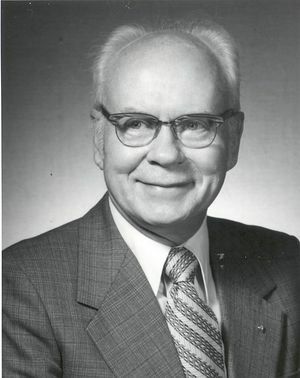 Harold Peterson applied his diverse talents as an engineer and administrator to engineering education during the last 30 years of his career, and was Chairman of the Department of Electrical Engineering at the University of Wisconsin-Madison for 20 years. He provided leadership and scholarship in the development of the Ph.D. program and personally directed the research of many MS and Ph.D. candidates. His research, publications and teaching have always been at the frontiers of modern technology in analog and digital computer applications, power systems analysis and transient phenomena. In recent years, his effort has been distinguished by contributions in the areas of DC transmission and Superconductive Magnetic Energy Storage. The technical contributions of his Ph.d Students in their subsequent careers and Harold's active participation in national and international engineering and educational activities have earned him recognition as one of a select few eminent power engineering educators. Peterson was recognized for excellence in education throughout his career. In addition to the 1978 IEEE James H. Mulligan, Jr. Education Medal, he also received the a Senior Fulbright Lectureship ad the Technsiche Hochschule in Hanover, Germany; a Special Citation of Merit from the Wisconsin Utilities Association; 1957 Benjamin Smith Reynolds Award for outstanding teaching of young engineers; appointment to the Chair in Electric Power Engineering sponsored by the Wisconsin Utilities Association, and later to the Edward Bennett Distinguished Professorship. Peterson holds eight patents. Harold and his wife, Marion, resided in Green Valley, Arizona since his retirement. This page was last edited on 13 February 2019, at 18:27.